Fetch and Freight have simulated counterparts using the Gazebo Simulator which you can install locally on your system. The Construct Sim provides a way to simulate a Fetch in Gazebo via their cloud service using a single ROSJect link in case you want to avoid the installation process. Never run the simulator on the robot. Simulation requires that the ROS parameter use_sim_time be set to true, which will cause the robot drivers to stop working correctly. In addition, be sure to never start the simulator in a terminal that has the ROS_MASTER_URI set to your robot for the same reasons. simulation.launch spawns a robot in an empty world. 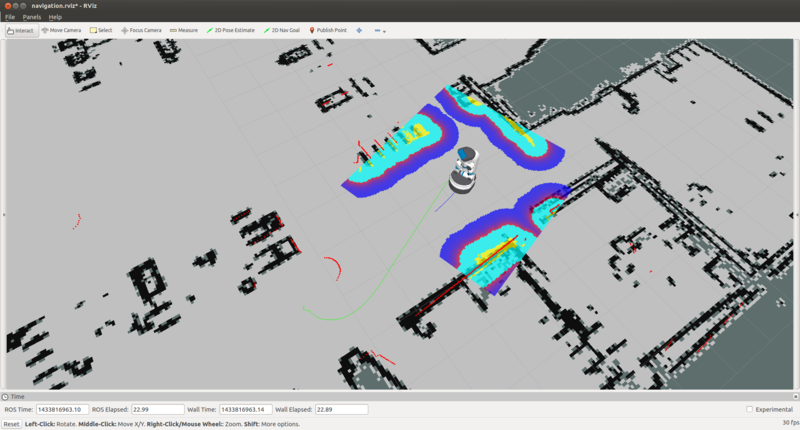 playground.launch spawns a robot inside a lab-like test environment. This environment has some tables with items that may be picked up and manipulated. It also has a pre-made map which can be used to test out robot navigation and some simple demonstrations of object grasping. Note that all of the environments will prepare the robot by tucking the arm and giving the head an initial command. 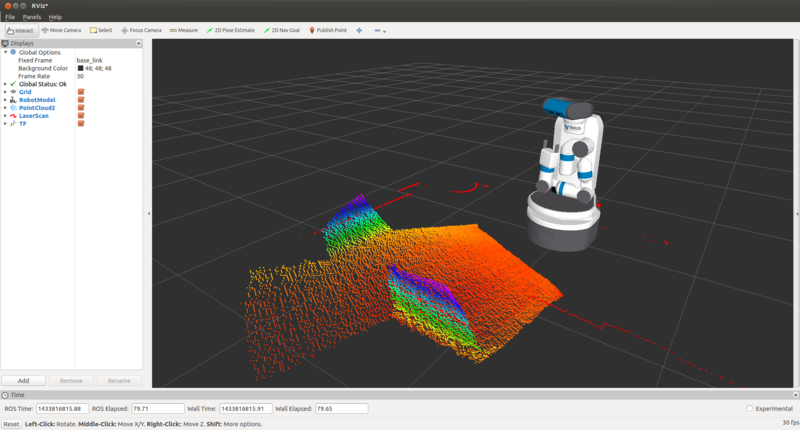 Even though Gazebo has a graphical visualization, RVIZ is still the preferred tool for interacting with your robot. fetch_nav.launch - this is the navigation stack with a pre-built map of the environment. move_group.launch - this is the MoveIt configuration which can plan for the movement of the arm. basic_grasping_perception - this is a simple demo found in the simple_grasping package which segments objects on tables and computes grasps for them. demo.py - this our specific demo which navigates the robot from the starting pose in Gazebo to the table, raises the torso, lowers the head to look at the table, and then runs perception to generate a goal for MoveIt. The arm will then grasp the cube on the table, tuck the arm and lower the torso. Once the robot is back in this tucked configuration, the navigation stack will be once again called to navigate into the room with the countertop where the robot will place the cube on the other table. 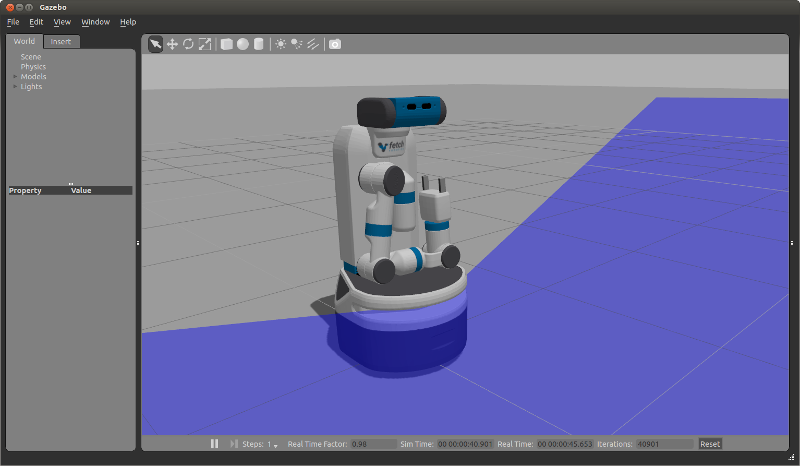 You can start testing and programming Fetch robots in 30 seconds! The simulator does not include the IMU. Therefore, there is also no base odometry fusion with IMU data, and the base_controller directly publishes all required TF data directly. The simulated robot does not have the head_camera/depth/* topics due to limitations within the Gazebo plugins. The simulated robot arm is not as well tuned as the real robot. The real arm will not wobble the way the simulated arm does when executing a trajectory. The simulated robot has also not been tuned with various payloads. It is best used for examining the workspace of the robot, and not the actual controls-related performance of the arm. The fingers of the real robot gripper are driven by the same leadscrew, so the object will always be grasped in the center of the gripper. With the simulated robot, the fingers are independently actuated, and so the object may drift to one side.